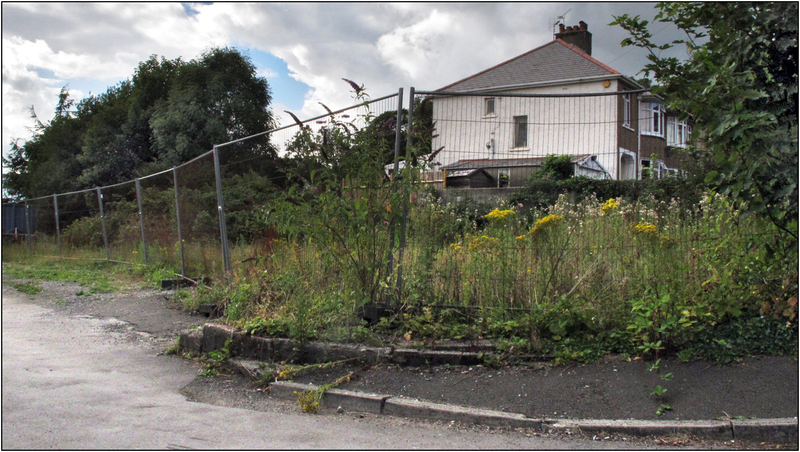 As I have mentioned elsewhere, I have recently been looking at locations that I haven’t visited in years and following the visit to Bridgend’s castle we wandered home via West Road and St Leonards Road and took a peek at a spot at which an incident took place when I was a very young teenager. I attended secondary school at Summerhill on Park Street, a private establishment taking pupils of all ages from primary right up to GCE and CSE levels. Split into two separate schools, the juniors in the house on Park Street and the seniors in wooden cabin-style classrooms built in the large garden at the rear. Behind all this and across an access lane was a small playground which us pupils used, this had a low wall built across part of it as a partition. Break times were in shifts, the juniors went out first and then the infants 3-5 years and the seniors went out together afterwards, hence the low wall partition. At lunch times though, there was an overlap period during which the whole school would be in this playground. I was not a good scholar, I hated learning, not interested in anything much and was most times bored with lessons, not all of them, but most, playtimes were a trial as one couldn’t escape in that small space and be left alone, which is what I mostly wanted. There was a slight salvation however as some of the older ones were allowed to keep an eye on the younger kids at break times and I was one such pupil. So, most break times I would be down the little-ones end keeping watch and interacting with them. No doubt this is probably where the idea of a future career in child care stemmed from. It was inevitable that whilst down the youngsters end I would also encounter slightly older kids from the junior school and one exuberant lad was always pestering me, chatting away and generally jumping about doing typically silly boy antics. I guess I was about fourteen at this time, maybe just fifteen, and one playtime this particular lad was messing about and climbed on the little low wall and jumped off it, his head catching me in the mouth and snapping off my front tooth, not completely, but at a diagonal from one corner nearly up to the gum. The lad implored me not to tell as he thought he might get into trouble and I never did, I told everyone I had fallen and bashed my tooth on a wall, don’t think anyone ever believed that though and I wondered how the lad would explain the blood from the cut on his head. As you’d expect, there were to be very many trips to the dentist and my first crown was a very ugly and crude affair, it was merely a piece glued on in an approximate shape and colour and the join could clearly be seen. It was explained that as my mouth was still growing I would have to wait a few years until I could have a proper crown which would not be noticeable from my other teeth. I was very self conscious about this thing in my mouth and stopped smiling, well not exactly completely stopped, but certainly made sure my mouth was shut when I did. For the next few years the temporary crown was replaced annually and I was nineteen before I had my proper crown fitted, this has been replaced twice since but the latest one I’ve had for decades. As for the little boy, he remained as boisterous and friendly as ever and I can still see his face now, but for the life of me can’t remember his name, well it was five decades ago. Anyway, back to the original purpose of this tale, the playground on St Leonards Road survives as a derelict space, overgrown mostly with brambles and the ubiquitous Buddleia and fenced off with temporary railings. I was surprised at how small it looked when you consider there would have been over 100 pupils out there at a time, more when the two sections of school overlapped briefly at lunch times. It would appear the site has recently been a storage space for building materials and will no doubt be developed at a later stage but meanwhile is a haven for birds and other wildlife. I did wonder if I would be able to find the other half of my tooth in all the undergrowth, I never did find it at the time! Would you know this lad if you were to see him today Mike? Probably not Natalie, no, I’d say definitely not! 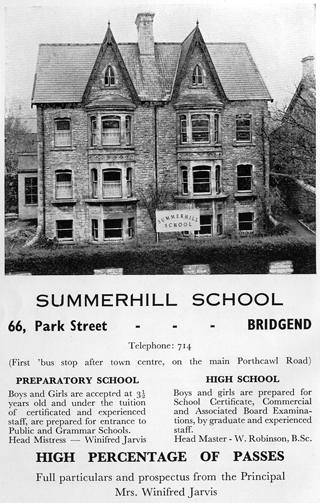 I attended Summerhill from about 1962 until its closure in 1967 when it had then relocated to Bryntirion, set in beautiful grounds and with much more classroom space. The old site in Park Street had previously been known as St. Margaret’s. I will always be grateful to my now long deceased parents for giving me the opportunity to attend such a lovely school and all my memories of Summerhill are happy ones.